Trying to find the perfect trailer for your travels that can be sturdy, reliable and not leave you with a heap of debt to pay off? The Jay Feather SLX might be the best choice out there for you. Recently released in early 2014, this latest addition to the popular Jayco brand comes with all of the benefits and additions that you would need for a long-term travel companion that can carry everything you need without weighing you down. The SLX model is part of Jayco’s larger family of Ultra Lite Travel Trailers. They are so-called “Expandable” trailers designed as a compromise between pros and cons of Pop-up Trailers (limited options for living & working area) and classic travel trailers (high cost and heavy weight). a) Living & working area is made as rigid (non-folding) structure. Thanks to that approach it provides room for everything you may need including fully equipped kitchen, dining and living space, closets and bath. So these amenities are non-negotiable guaranteeing you home-like comfort during “out-of-home” time. b) Sleeping areas use expandable space. Obviously you just need comfortable bed, but not necessarily whole bedroom in your trailer. In a way you can call these expandable travel trailers as “Pop-Out” campers. Indeed sleeping areas are popping-out horizontally from the main body of the trailer (hey, I personally claim the invention of the name “Pop-Out” campers!). And yet, they provide full comfort in most important section of the camper: living and working area. 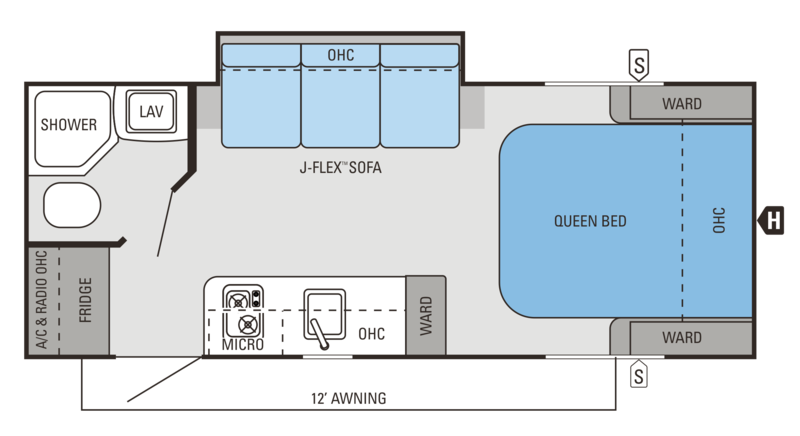 Jayco Feather SLX family includes four models with different floor plans: 16XRB, 18FDB, 18SRB and 19XUD. 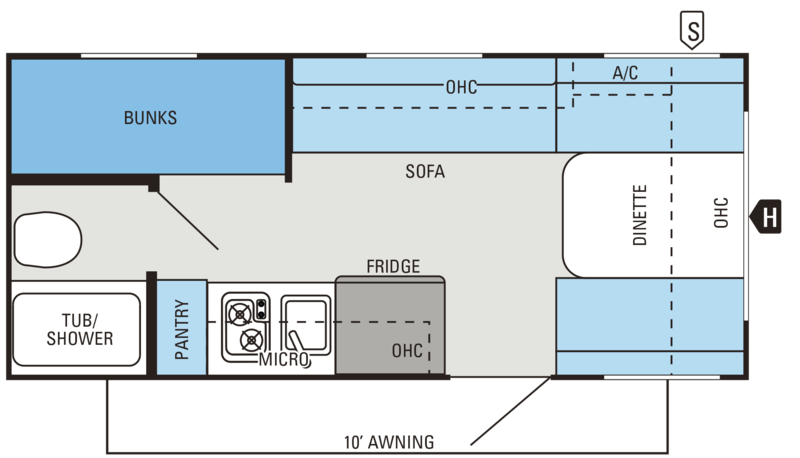 All models come with 4cu.ft Norcold fridge, 6 gal water heater with bypass, patio awning, microwave oven, shades, 2-burner cooktop range with hood, 8,000 BTU side-mounted AC, spare tire, AM/FM stereo with MP3 and iPod input, 30 amps electrical service. (13,500 BTU roof mounted AC unit is optional). The tent is made from DuraTek water-repellent, scratch-resistant vinyl and has zipper-type windows. The expandable, self-lockable tent base is self-supporting and has load rating of 1,100 lb. For your “extra” comfort - bathroom has roof vent and skylight! It’s worth to note that external walls are vacuum-laminated what guarantees much better weather resistance and durability. • Bunks and/or expandable tent-covered sleeping areas. Jayco’s Feather SLX series of trailers carries a modern and sleek design that gives you all the help you need to hike yourself across the country. It’s a fairly versatile little trailer easily towed by just about any mini-van (just double check with the manufacturer or RV dealer to make sure). It’s a very fairly priced and for the purchase you are getting a complete travel system that can easily store all of your luggage and needs without any problems, without bogging down the vehicle as you go. It’s important to get the best quality of trailer that you can as you want it to last you many trips into the future, and this is the perfect addition for anybody looking to make the jump to a lightweight trailer. It’s safe, it’s smooth and it’s comfortably priced – what more could you want? The bottom line is - if you are planning some time away with all the delights of back home why not consider picking up one of Jayco’s Jay Feather SLX Travel Trailers?